The last time we talked to the VESA was back in September, where the association announced their long-awaited DisplayPort 1.3 standard. Introducing a newer, higher signaling rate technology (HBR3) to drive higher resolution and higher refresh rate panels, DisplayPort 1.3 was targeted at driving newer display configurations such as 5K displays, multiple 4K displays via MST, and 8K displays with lower resolution 4:2:0 chroma subsampling. Now 5 months later, the VESA and its partners are applying the same technology upgrades and more to the Embedded DisplayPort (eDP) standard, which today is being updated from 1.4 to 1.4a. The mobile counterpart to the standard DisplayPort standard, eDP defines a slightly different standard for laptops and other portable devices, with additional implementation details and features to better fit (and directly drive) mobile displays. Meanwhile despite the unassuming name change for this latest version, the introduction of eDP 1.4a is in practice a very substantial upgrade to the standard, introducing not only higher bandwidths but also new technologies that did not make it into DisplayPort 1.3. From a bandwidth perspective, eDP 1.4a adds the HBR3 signaling mode from DP 1.3, giving eDP 1.4a the same 8.1Gbps/link data rate and the same ability to drive displays up to 5K (5120x2880) in resolution losslessly. While we’re unlikely to see 5K panels in laptops any time soon, this development is still important as the VESA and its members have other uses for the higher link speeds. Joining HBR3 in this new version of eDP is support for the VESA and MIPI’s Display Stream Compression technology, which was first announced last year and has been in development for some time. With DSC, the VESA is tackling the display bandwidth problem from the other direction, focusing on reducing bandwidth needs through the use of a lossy, high quality “visually lossless” compression algorithm. Using a fixed rate codec with a series of different compression modes, DSC can reduce display bandwidth needs by as much as 3:1 (66%) while still retaining what should be a high quality image. 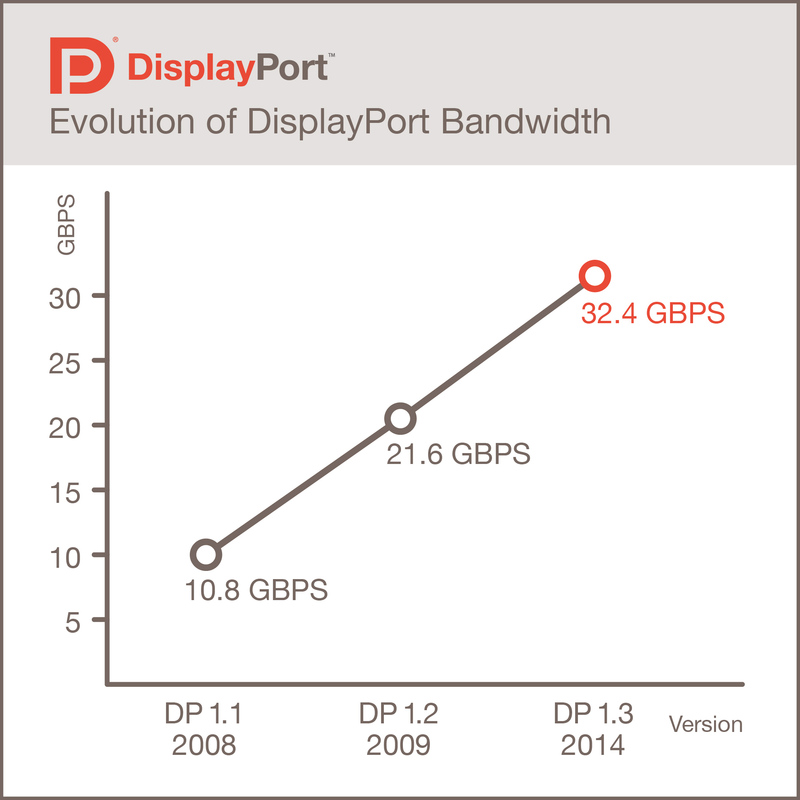 DSC missed the initial cut for DisplayPort 1.3 last year, and as a result is finally making its debut in eDP 1.4a. In the case of eDP 1.4a, it’s only with the combination of HBR3 and DSC that the standard delivers on its greatest benefits. By ratcheting up link speeds while simultaneously reducing bandwidth needs, the VESA is looking to reduce the number of links that displays need to implement to deliver a similar image, reducing the amount of power that must be spent on links and frame buffers. Though DSC and HBR3 add their own overhead to link operation, TCONs, and display controllers, being able to reduce the number of links should save more power than the new technologies cost due to the relatively high power costs of differential signaling, allowing device manufacturers to work on a sliding scale between bandwidth and power savings. Meanwhile HBR3 + DSC also offers an alternative to using lower chroma subsampling resolutions to drive 8K displays, replacing the loss in chroma resolution with DSC. As with 5K panels, 8K panels are unlikely to appear in laptops, however this scenario would be applicable to devices with integrated displays such as All-In-One PCs and similar devices. Consequently while DSC didn’t make the cut for DisplayPort 1.3, we wouldn’t be surprised to see a DisplayPort 1.3a standard a bit farther down the line that adds DSC support, as eDP and DP often cross-pollinate on new technologies (HBR, Panel Self Refresh, etc). Finally, eDP 1.4a also introduces one other feature not found in any previous DisplayPort standard: Multi-SST Operation (MSO). 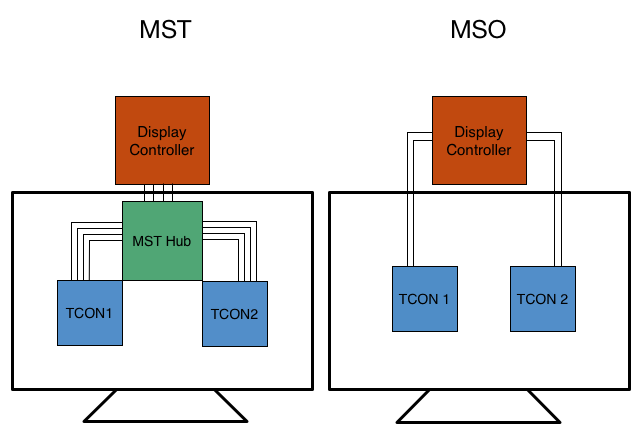 A kind of MST on steroids, MSO allows for the links in an eDP connection to be split up to drive separate panel segments/tiles, rather than teaming up all of the links and multiplexing the signal for all of the segments via MST. Though this doesn’t save in the number of links required, going this route allows for each tile to have a simpler TCON that doesn’t need to be able to handle the full bandwidth and complexity of a 4 link MST setup. Proposed by Samsung, MSO should drive down the cost of the TCONs required, along with the power/heat/space benefits that come from using simpler TCONs. Wrapping things up, the VESA says that they expect the first eDP 1.4a devices to appear in 2016, in-line with the roughly 1 year window between standard adoption and device implementation that has followed previous DP standards. However I’m hoping we’ll be able test devices sooner than this, as we are very curious just how well DSC will work in practice and what the real image quality tradeoff will be for using it. While I personally wouldn't want my display to use this, I kind of understand the problem that VESA is facing. An 8K display requires absurdly high data rates to run at 60 Hz, 8 bpc (bits per component), and thats not even "professional grade" then, as they want 10 or 12 bpc.